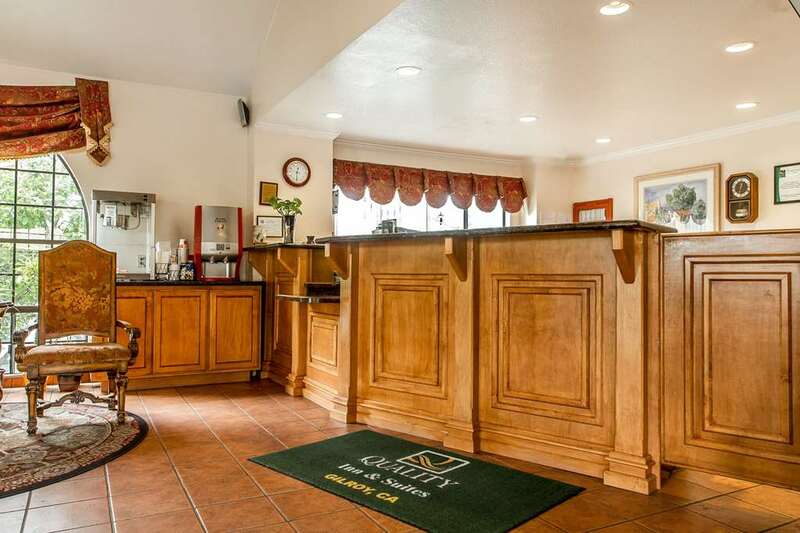 Get more for your money at the Quality Inn and Suites hotel in Gilroy, CA. This pet-friendly hotel is located near destinations like Christmas Hill Park, Gilroy Golf Course, Rapazzini Winery, Mount Madonna Park and Bonfante Gardens. The Old Mission San Juan Bautista and Gavilan College are also close. Take advantage of amenities like free hot breakfast, free WiFi, business center and guest laundry facilities. Rooms include a flat-screen TV, microwave, refrigerator, hair dryer and coffee maker. Also, earn rewards including free nights and gift cards with our Choice Privileges Rewards program.